The library has a few book collections which may be used by book discussion groups. Included in the list are A Dog’s Purpose (3+) by W. Bruce Cameron, A Long Way Gone (10) by Ishmael Beah and The Dispossessed (9) by Ursula Le Guin. Interested groups may contact Adult Services by phone at 573-334-5279 or at the Information Desk. 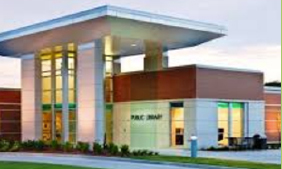 If you love to read, but can’t get out due to health or disability, the Cape Girardeau Public Library can get books to you by mail or the volunteers of Love INC (Love in the Name of Christ) will deliver and return library materials for you. The process to sign up for this service is simple. Just call the library at 573-334-5279 and we will take your information. If you don’t already have a library card, we will tell you how to get one. We will then ask you to fill out an information card about what type of books you enjoy reading and we will choose materials based on your preferences. If materials you wish to borrow are not available in this library, the staff will try to borrow them from another library. The Cape Library borrows primarily from Missouri libraries, but a wider search can be made. The library uses a courier service to deliver most requests. If the lending library is on the courier service, there is no charge for the requests. Charges for Items coming from a lending library that is not on the courier service will be passed on to the borrower. An average wait for materials is two weeks. InterLibrary Loan books check out for three weeks. To start the I. L. L. process call the Information Desk at 5 73-334-5279, ext. 113 or 121. The library does not offer test proctoring services. Contact the Southeast Missouri State University or the Career and Technology Testing Centers. Citizens may register to vote at the library. Forms for new voter registration or for updating information may be obtained at the Adult Information Desk and filled out at the library. A picture I. D. is required. A staff member from the county clerk’s office periodically picks up completed forms. The library also has a schedule of elections and the last day to register to vote for each one. The library offers free Wi-Fi access for all electronic devices. There are five access points in the library. A one-time code and a library card or guest pass is needed and will be saved on your devices for future use. Ask at the Information Desk for assistance. Wi-fi printing is also available. Tables with electrical outlets are situated throughout the building. Free computer classes are given in the Praxair Computer Lab. Basic internet searches, Microsoft Excel, Microsoft Word and e-mail are periodically offered. Additional classes may include social networking and using mobile devices. Programs are free and open to the public. Registrations are required for these programs as space is limited. Watch for future offerings on the Adult Programs page. Staff members are always ready to assist patrons. Library staff answer questions in person, over the phone or by e-mail. If you are searching for information, have a question about policies, location of materials, readers advisory, how to use library equipment or databases, or other concerns ask at the Information Desk. To reach the Information Desk call 573-334-5279, ext 113 or 121, or reach us online at as@capelibrary.org. Library users are encouraged to ask at the Information Desk or Youth Services Desk for assistance in finding reading materials. The library subscribes to NoveList Plus, an online database which has a treasure trove of book suggestions based on author, title and subject plus genres, author read-alikes, feature articles and book discussion guides. Reference titles such as What I Do I Read Next? and Genreflecting also offer ideas for reading. To see what your friends are reading, keep track of what you’ve read or even join a book club, try goodreads. The library staff selects books and other materials on the basis of practicability, literary worth, informational merit and anticipated public demand. If you are interested in materials that aren’t available at the library, leave a request with the Information staff. Requests may be made for books, books-on-CD, Music CDs and DVDs. New items may be purchased and added to the library’s collection. Others may be requested through the interlibrary loan service. If you are doing research on ancestors from the Cape Girardeau area, check out our genealogy section. The Genealogy Room offers the use of two reader/scanners, two internet computers and a copier. It contains county histories from nearby surrounding counties, published family histories from some local families, and microfilm archives of the Southeast Missourian back to 1918. Visitors may also find limited volumes of birth and death records for Cape Girardeau County and some surrounding counties, ship records of immigrants in Passenger and Immigration Lists indexes and New Orleans Passenger Lists indexed on microfilm. The library offers interlibrary loan services for microfilm records. The internet computers have several genealogy related databases and also a subscription to Ancestry.com. Housed in the Genealogy Room are two microfilm reader/scanners designated for genealogical research. The machines are for public use. Prints made from the microfilm readers are $.15 per page. Study rooms and study carrels are available for patron use on a first come-first served basis. Study rooms contain a table with four to eight chairs, whiteboards and electrical outlets. Study carrels may be found around the perimeter of the Adult Services area. Vending machines offer a variety of beverages and snacks. Seating in the cafe area can accommodate small groups. Comfortable seating for reading can be found in the atrium. Newspapers and magazines are kept in this area. Most magazines can be checked out for a week. Newspapers are available for in-house reading. Tables with reading lights and electrical outlets are also available. Additional seating can be found around the perimeter of the Adult Services area. The open air terrace is enclosed on three sides with an overhang covering the tables and chairs for seating comfort. You can access the terrace from the Coffee Bar area. There is no outside entrance or exit from the terrace.